If you're looking for the scariest kid's costumes of all time, look no further than HalloweenAdventure.com. Our remarkable selection of scary kid's costumes is as massive as it is impressive and you're sure to fall head-over-heels in love with our sensational prices! 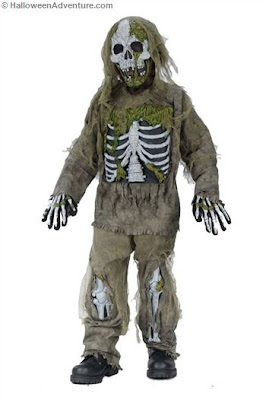 So, whether you're looking for something slightly spooky or something freakishly frightening, you're sure to find the perfect scary children's costumes at HalloweenAdventure.com! Just take a look at the cool and creepy costumes we're offering this year. Simply click the links below or visit HalloweenAdventure.com for more sinfully scary costumes! 1. Is your preteen a glam queen with a taste for the macabre? Does she enjoy the magical attributes of fairies but hates the pastel colors and glitter associated with them? If so, she'll absolutely love spreading dark despair everywhere so goes in our ultra-trendy Evil Pixie Costume. This spunky sprite looks sensational from the tip of her black pixie wings to the bottom of her jagged hem dress! 2. If he's fascinated by the Grim Reaper, we have the perfect costume to satisfy his curiosity! Our Grave Reaper child's costume includes a full-cut horror robe with hood, skull mask, tie belt and sculpted bone gloves. Collect the goodies in style this Halloween! 3. 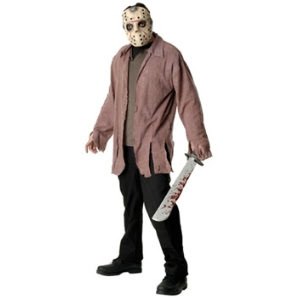 If he loves slasher films and can't get enough of senseless blood and gore, he'll go crazy over our Friday the 13th Jason costume. After all these years, Jason Voorhees is still the coolest, most fearsome axe-wielding murder of all time. 4. Does he prefer a life of seclusion? Does he enjoy fashioning home decor out of bizarre components? Is he handy with a chainsaw and creative with a butcher knife? Then make his dreams come true when you purchase our horrifyingly awesome Leatherface child's costume. Let the massacre begin! 5. Does he have a ravenous appetite for things you wouldn't even dream about putting in your mouth. Is he clumsy but determined? Does his odor sometimes repulse you? Then he'll be a real hit in our Skeleton Zombie costume. This seriously scary costume isn't for the faint of heart but it's perfect for the horror loving preteen! 6. If it's classic horror that sets his head spinning, he's sure to enjoy our Universal Studios Frankenstein costume. This classic costume is sure to turn heads by itself and when it's combined with our Universal Studios Frankie's Girl costume to create a creepy couple's look! 7. Does she ooze Halloween spirit? Is she not afraid of making her darkness known to her peers? Then she'll love leading the crowd in our Zombie Cheerleader Costume. This perky preteen manages to keep a fair amount of school spirit regardless of her situation! 8. Do you constantly warn him about how his dangerous skateboarding tricks can earn him a spot at he morgue? Do his teachers complain that he's a punk with an inappropriate fashion sense? Then let him throw caution to the wind and live it up in our Zombie Skate Punk costume. This decaying daredevil is ready to let the good times roll! Didn't find the perfect scary costume for your child in our compilation? Don't worry, there are still thousands of other costumes available at HalloweenAdventure.com that are sure to satisfy your child's hankering for horror. Well, what are you waiting for? Halloween is just around the corner and the scariest children's costumes are just a click away!